Using a pressure washer pressure can allow you to clean your deck or the outside of your home, but you need to know how to use the washer properly and safely to ensure you don’t damage your property or cause injury to yourself. Pressure washers vary in size and capability and knowing a few things about their differences and settings will help you to achieve the best possible success with your cleaning projects. Before you start using a pressure washer, make sure you have cleared the area of anything that could be easily broken. As the tool’s name suggests, the water is going to be coming out at high pressure and can do a lot of damage if you aren’t careful. If you’re cleaning your deck, you want everything to be moved off the surface. If you’re cleaning the exterior of your home, make sure you have identified electric boxes and other areas you don’t want to touch with the water stream. Many people who choose to pressure wash a deck, concrete, or siding also want to add some type of cleaner to the spray to ensure the best results possible. If you have mildew growing on your deck or on part of your siding, you might consider adding a 10% bleach solution to the water. If you do choose to use a cleaning agent in the water, you need to make sure it will not damage your home’s siding and that it will not damage any of the plants it may come in contact with. There are several systems available as add ons to pressure washers that facilitate mixing additives and cleaning solutions to the water in proper quantities. In most cases, the typical method of getting water into the pressure washer is by attaching it directly to your hose outlet. This should provide sufficient amounts of water to power the washer. Once you have it attached and the pressure washer is started, do not touch the trigger until you are ready to get started. You want to check the output pressure level of the water before you begin. 1500 PSI is a good setting because it will clean most things well, such as your deck, but should not have enough force to do damage to the harder woods or to the siding of your home. However, you should always consult the instruction manual of the washer first to see what pressure settings they recommend for various uses. Most pressure washers use a quick-connect nozzle that varies the output pressure and sets the spray pattern for the pressure washer. The tips are frequently color-coded to indicate the fan pattern and thus the pressure. Zero degrees which results in a tight pencil point pattern. Since no fan pattern is created, this is the highest pressure level possible and is most certainly NOT the nozzle you would use for general cleaning purposes. You would use this tip for high pressure cleaning of metal surfaces or to really chew away stubborn concrete stains. This produces a 15 degree fan pattern and it perfect for use as a virtual “scraper” to take off paint or stubborn mildew stains from PVC fencing. The truly tough stains will call for this tip more often than any others. This tip yields a 25 degree fan pattern. Primarily used for washing, this is the tip you’ll use for tough jobs that need a good balance between scrubbing power and delicacy on the surface. This 40 degree fan tip is perfectly suited for rinsing and delicate washing. These are the tips to use for washing/rinsing glass or washing vehicles. These are great tips for wooden decks and all delicate substrates. These tips are especially made for use with chemical additives. It results in a wide spray with the lowest pressure, helping to facilitate a siphoning action to introduce the chemical to the water flow. Depending on what you are washing, you’ll need to use a slightly different technique. If you are spraying your deck, use a sweeping motion, always moving away from the house, to apply the water. 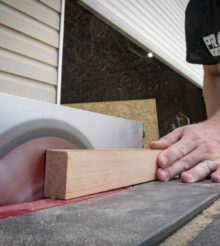 Use the same motion and direction the entire time to prevent leaving marks behind on the surface of the deck. The tighter the spray pattern, the more likely you are to over-clean an area or leave marks. If you are spraying down the side of your house, use the same sweeping motion from side to side, always starting on the same side, but begin at the top of your house and work down. Remember to always hold the wand tightly during the wash; otherwise, you or someone else could get injured. You’ll want to keep moving around your deck, patio or home with the pressure washer until you’ve thoroughly cleaned it. If you run into trouble with the washer, check the intake valve or make sure the water supply is coming through correctly. Ensuring you follow these steps correctly and adhere to the manufacturers suggested procedures will result in a successful cleaning project.